Tiramisu (Italian: Tiramisù) is one of the most popular Italian cakes. It is made of savoiardi (otherwise known as lady finger biscuits) dipped in espresso or strong coffee or rum, layered with a whipped mixture of egg yolks, mascarpone, and sugar, and topped with cocoa. 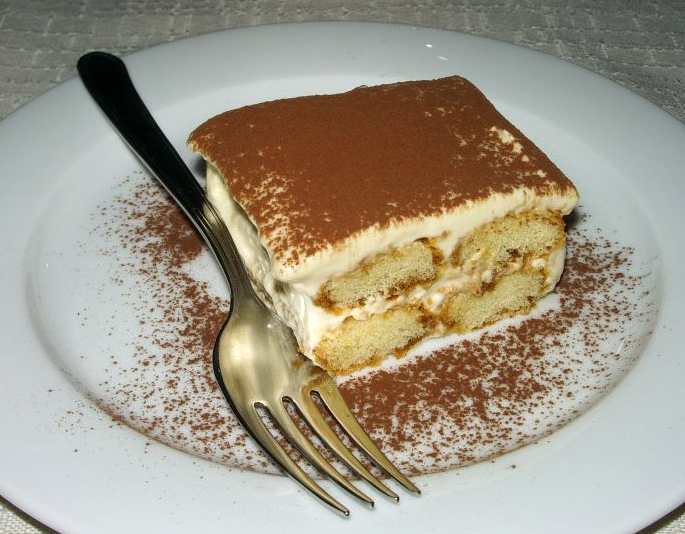 Tiramisù has become a very popular dessert. The recipe has been adapted into cakes, puddings, and other varieties of dessert. The phrase tirami su literally means "pick me up" or "pull me up" in reference to the effects of the sugar and espresso. It is also thought to mean "pick me up to heaven" due to the delightful taste. The original recipe called for the following ingredients: savoiardi biscuits, eggs, sugar, mascarpone, cocoa, honey, and club soda. In the original recipe, there was no liquor as the cake was originally aimed at children and the elderly, and the original shape was round. Tiramisù is made by soaking savoiardi biscuits in espresso with the optional addition of liquor and sugar and layering them with a mixture of mascarpone cheese and zabaglione, a light custard made with Marsala wine or a liqueur. Cocoa powder is sprinkled on top of the dessert, which is refrigerated before being served.